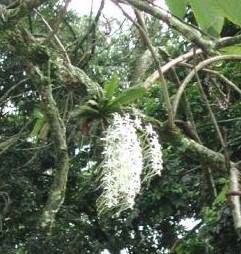 This delicate epiphytic orchid, a mini plant with maxi roots is covered in a mass of white flowers at the beginning of summer. This showy epiphytic orchid is found on trees in the warm, drier woodlands of southern Africa. The plant has strap-shaped, dark green leaves up to 130 mm long on short stems. The large numbers of roots are grey with white streaks, at times encircling the host branch. Numerous sprays of 6-12 well-spaced white flowers with a 40-60 mm spur, cover the plant in October and November. It is found in Eastern Cape, KwaZulu-Natal and Mpumulanga and is also thought to occur in Swaziland. Plants are found in dry, thorny scrub often on Acacia trees. The plants once established are able to tolerate light frosts. The genus name, referring to the rostellum lobes, means small moustache. There are12 species in the genus which occur in South and East Africa. Seven species occur in South Africa of which M. capense is the showiest. 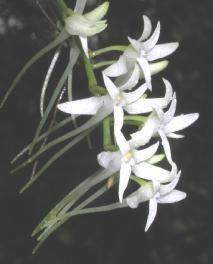 Because it is white and is strongly scented at night, it is probable that moths pollinate it. The very fine seed germinate readily on exotic tree species such as oranges (Citrus sp. ), which can be a problem to farmers, and cypress (Cupressus sp.) in the Natal Midlands. Mystacidium capense adds interest to a garden when established on a specimen tree. Traditionally the plant is used as a protective and love charm. It is in great demand by orchid growers. Mature plants should be attached to smooth-barked, preferably deciduous trees using strips cut from old pantyhose. The plants should be watered sparingly until the new roots appear, after which an occasional spraying with a liquid fertilizer will benefit the plants. Plants can also be grown on slabs of pine bark and hung in a shady place. These plants would need to be watered regularly if they are kept out of the rain. BATTEN, A. & BOKELMANN, H. 1966. Wild flowers of the eastern Cape Province. Cape & Transvaal Printers, Cape Town. JACKSON, W.P.U. 1987. Origins and derivations of names of South African plant genera. University of Cape Town. LEISTNER, O.A. 2000. Seed plants of southern Africa: families and genera. Strelitzia 10. National Botanical Institute, Pretoria. STEWART, J., LINDER, H.P., SCHELPE, E.A. & HALL, A.V. 1982. Wild orchids of South Africa. Macmillan, Cape Town.